Immunocytochemistry/Immunofluorescence: TERF2IP Antibody [NB100-56321] - HeLa cells were fixed for 10 minutes using 10% formalin and then permeabilized for 5 minutes using 1X TBS + 0.5% Triton-X100. The cells were incubated with anti-TERF2IP [NB100-56321] at a 1:200 dilution overnight at 4C and detected with an anti-rabbit Dylight 488 (Green) at a 1:500 dilution. Alpha tubulin (DM1A) NB100-690 was used as a co-stain at a 1:1000 dilution and detected with an anti-mouse Dylight 550 (Red) at a 1:500 dilution. Nuclei were counterstained with DAPI (Blue). Cells were imaged using a 40X objective. 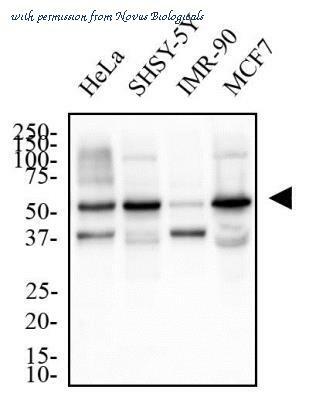 Western Blot: TERF2IP Antibody [NB100-56321] - Total protein from HeLa, SHSH-5Y, IMR-90 and MCF7 cells was separated on a 12% gel by SDS-PAGE, transferred to PVDF membrane and blocked in 5% non-fat milk in TBST. The membrane was probed with 2.0 ug/ml anti-TERF2IP in 1% non-fat milk in TBST and detected with an anti-rabbit HRP secondary antibody using chemiluminescence. Western Blot: TERF21P Antibody [NB100-56321] - Detection of hRap1 in 293 cells: Two microgram of anti-Rap1 (Cat. # this antibody. A protein band with an approximate molecular weight of 50 kDa was detected. 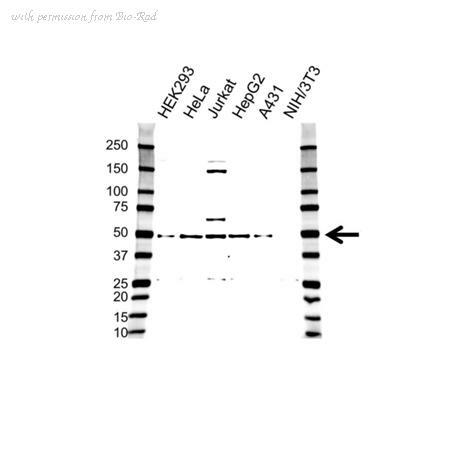 Immunoprecipitation: TERF21P Antibody [NB100-292] - Detection of Human RAP1 by Western Blot of Immunoprecipitates. 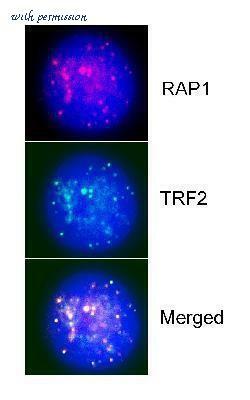 Immunocytochemistry/Immunofluorescence: TERF21P Antibody [NB100-292] - Localization of RAP1 to Telomeres with TRF2 by Immunofluorescence, using NB 100-292. Sample: HeLa cells. Western Blot: TERF21P Antibody (78B356.1) [NB100-56526] - Western blot analysis of A431 (A), HEK293 (B) and HeLa (C) lysates (35ug per lane, RIPA buffer) using TERF21P antibody (NB100-56526) at 0.1ug/ml. Band observed at ~60kDa. TERF2IP Antibody (C-term) (ABIN657968) western blot analysis in ZR-75-1 cell line lysates (35 µg/lane). 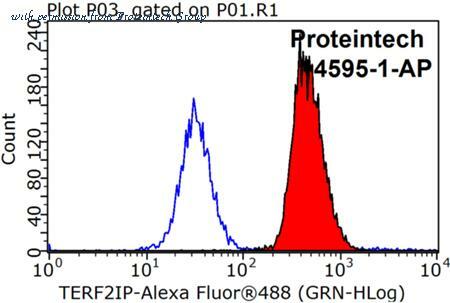 This demonstrates the TERF2IP antibody detected the TERF2IP protein (arrow). 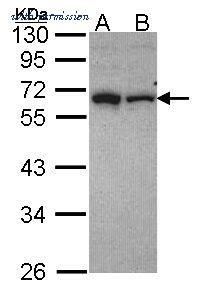 The TERF2IP antibody from Proteintech is a rabbit polyclonal antibody to a recombinant protein of human TERF2IP. This antibody recognizes human,mouse,rat antigen. The TERF2IP antibody has been validated for the following applications: ELISA, WB, IF, IHC, IP, FC analysis. 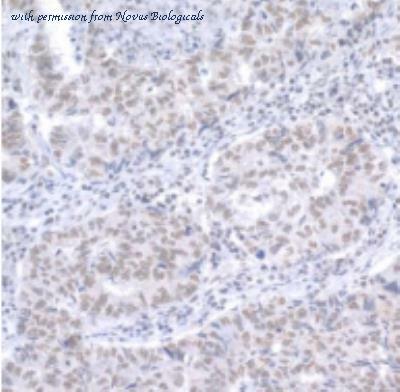 Immunohistochemical analysis of paraffin-embedded SCM1 xenograft using RAP1 (PA5-27588) antibody at 1:500 dilution. 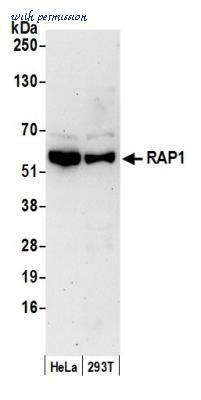 Western Blot analysis of RAP1 using anti-RAP1 Polyclonal Antibody (PA5-27588), in Mouse Brain (50 ug of cell lysate) and at a dilution of 1:1000. Western Blot staining of Human Tonsil lysate using PA5-19129 at a concentration of 0.2 ug/ml, the primary antibody incubation was 1 hour and the detection method was chemiluminescence. 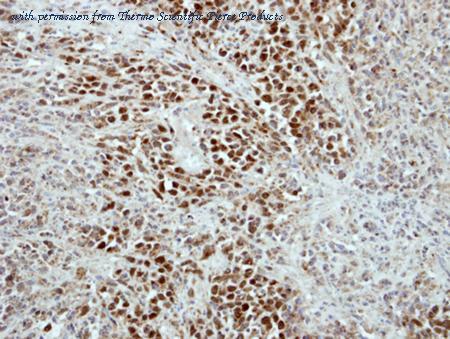 Anti-TERF2IP antibody IHC of human testis. Immunohistochemistry of formalin-fixed, paraffin-embedded tissue after heat-induced antigen retrieval. Antibody concentration 5 ug/ml. This image was taken for the unconjugated form of this product. Other forms have not been tested. 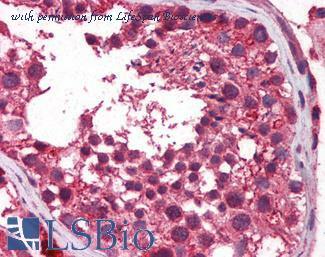 orb20527 (0.2ug/ml) staining of Human Tonsil lysate (35ug protein in RIPA buffer). Primary incubation was 1 hour. Detected by chemiluminescence.